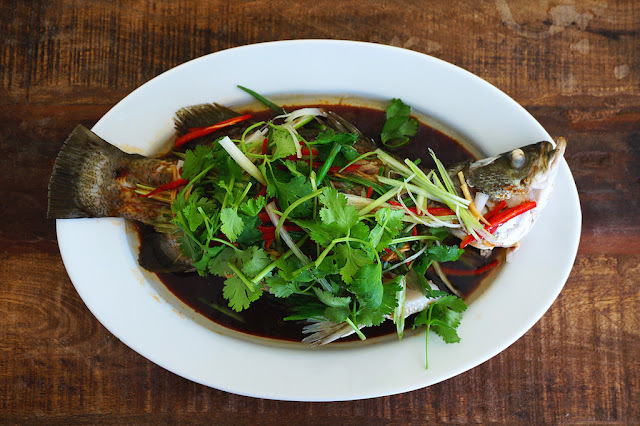 This quick and easy steamed fish is one of my favorite dishes. It is also known as Cantonese-Style steamed fish. It's healthy and delicious. Aromatic Soy Sauce: Combine light soy sauce, coriander and scallions. Let it steep for about 10 minutes. Place the fish on a metal plate and scatter scallions and ginger all over the fish. Steam on high heat for 6 to 8 minutes, or until the fish is cooked. Remove and transfer the fish onto a serving plate. Top the fish with julienned scallions, ginger, and chili. Heat the shallot or peanut oil until smoking. Then carefully, pour the hot oil all over the fish. Spoon some aromatic soy sauce, top with fresh coriander and serve immediately.